Pyscho-Pass takes place in a future Tokyo in which everything is governed by the Sybil System. It determines everything including what profession is appropriate for everyone by evaluating people’s psychological profiles. One such factor is the individuals’ crime coefficients. If that gets too high, Sybil assumes the person is a “Latent Criminal”, or someone who can potentially commit a crime, and thus strips their rights away from them. Enter Tsunemori Akane, a fresh police inspector. She must team up with Enforcers, or Latent Criminals who are tasked with the dirty work of law enforcement, to make Tokyo a little safer for the rest of us. Upon meeting Enforcer Kogami Shinya, Akane’s career goes on a path she could never have expected. Since I haven’t been watching anime series for a while (I’ve been watching mostly Ghibli movies as of late), I haven’t been keeping up with a lot of the newer series. Psycho-Pass first aired at the end of 2012. What I noticed from the beginning was some pretty slick animation. A lot of the animation is pretty obviously CG, but overall it meshed pretty well with the traditional cel animation. The character designs, particularly that of Akane, took a little while to get used to, but they worked very well since they all told me something about them. Am I the only one who saw Shinya and kept thinking, “Spike!” whenever I saw him? The animation was probably a double edged sword. The series was 22-episodes long. I think it’s an odd length since series are usually closer to 26 episodes long if they have gotten up to the 22-episode mark at all. I suspect, like Last Exile, the series went way overbudget and Production IG decided to end the series as quickly as possible. 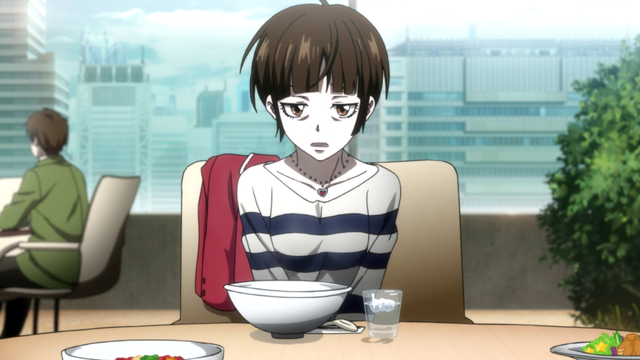 The reason I say that is because Psycho-Pass was absolutely full of woefully underdeveloped characters. We spend the series following Akane and Shinya most of the time. I went through much of the series not even remembering many of the Enforcers’ names, let alone why I should care about them. There wasn’t enough script to go around. I wish I had a better understanding of the main antagonist’s motivation, and I really wish I cared when an Enforcer got killed upon discovering a secret underlying his society. Akane spent exactly one scene getting to know the guy. Psycho-Pass kept me hooked throughout its run. The fight scenes were well choreographed, and the world was fascinating. The latter half of the series was a real roller coaster ride when we see the basis of the series’ society threatened. I wish the series was longer so I could get to know the characters better, and that will be addressed in the presently ongoing Psycho-Pass 2. Nice to see you began Psycho-Pass. Whoever your friend is he has good taste. As for the animation it is very slick animation. That said my opinion is different from yours I though the storyline was attention grabbing too but also the character development as well. I cried when poor Kagari the Enforcer died. And also thought Kanamori the science and computer specialist in Psycho-Pass was hilarious at times. As for Psycho-Pass 2 if your thinking its going to develop the series further I don’t think that will happen. Yor basically getting a new storyline now. So its not really building on the universe in the series. Its only continuing it but if like me you though everything was excellent in Season 1 which is Psycho-Pass then you will likely end up satisfied with Psycho-Pass 2.